CBS is sticking with it’s daytime line-up and have renewed The Bold and The Beautiful, The Talk, Price Is Right, and Let’s Make a Deal. The network previously renewed The Young and The Restless for 2013-14. CBS, the top-rated network in Daytime with audience growth across the daypart, has renewed its entire daytime schedule for the 2013-2014 season. Renewed for next season are THE BOLD AND THE BEAUTIFUL, the most-watched dramatic serial in the world; THE TALK, the fastest-growing daytime talk show; THE PRICE IS RIGHT, daytime television’s most-watched program; and LET’S MAKE A DEAL, which is growing double-digit percentages in key demos. THE YOUNG AND THE RESTLESS, the #1 daytime drama for more than 24 years, celebrating 40 years on the air on Tuesday, March 26, previously received a pickup as part of a multi-year deal. This season, THE TALK is averaging 2.35 million viewers, up +11% from last year, 1.0/06 in women 25-54 and 0.7/04 in women 18-49. In the week ending Jan. 13, THE TALK delivered its largest weekly audience ever while matching “The View” in women 25-54 and women 18-49 for the first time this season in a week of regularly scheduled broadcasts. In 2012, THE TALK was nominated for a Daytime Emmy Award for Outstanding Talk Show. THE PRICE IS RIGHT, daytime television’s most-watched program, hosted by Drew Carey, recently celebrated its 40th anniversary. THE PRICE IS RIGHT 1 is averaging 4.30 million viewers, 1.2/07 in women 25-54, up +9% and 0.8/06 in women 18-49. PRICE IS RIGHT 2 is averaging 5.17 million viewers, up +1%, 1.4/09 in women 25-54, up +8% and 1.0/06 in women 18-49. 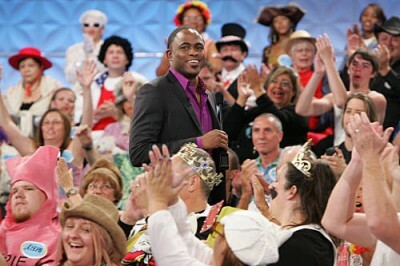 LET’S MAKE A DEAL, with host Wayne Brady, will return for season five. LET’S MAKE A DEAL 1 is averaging 2.53 million viewers, up +9%, 0.8/05 in women 25-54, up +14% and 0.6/04 in women 18-49. LET’S MAKE A DEAL 2 is averaging 2.94 million viewers, up +9%, 0.9/05 in women 25-54, up +13% and 0.7/05 in women 18-49, up +17%. THE YOUNG AND THE RESTLESS, which has been the #1 daytime drama for more than 1,255 consecutive weeks – or 24 years – will celebrate 40 years on the air on Tuesday, March 26. It is averaging 4.74 million viewers, 2.1/13 in women 25-54 and 1.4/09 in women 18-49. THE YOUNG AND THE RESTLESS is broadcast weekdays (12:30-1:30 PM, ET; 11:00 AM-12:00 Noon, PT) on the CBS Television Network and is produced by Bell Dramatic Serial Company, in association with Sony Pictures Television. THE BOLD AND THE BEAUTIFUL, which celebrated its 25th anniversary on March 23, 2012, is a Bell-Phillip Television production, broadcast weekdays (1:30-2:00 PM, ET; 12:30-1:00 PM, PT) on the CBS Television Network. THE TALK features a panel of well-known news and entertainment personalities discussing current events, pop culture, contemporary issues, family, celebrity and the trending topics of the day. The daily one-hour series is co-hosted by Julie Chen, Sara Gilbert, Sharon Osbourne, Sheryl Underwood and Aisha Tyler. The hosts swap stories, challenge each other on issues and engage the studio audience and viewers at home about events in the headlines and their own homes. Show segments include guest interviews with entertainers and newsmakers, musical performances, how-to demos and appearances from extraordinary people with stories that engage and inform. The show was developed by Gilbert, who also serves as executive producer. THE PRICE IS RIGHT is the longest-running game show in television history. Produced by FremantleMedia North America, THE PRICE IS RIGHT is broadcast weekdays (11:00 AM-12:00 Noon, ET; 10:00-11:00 AM, PT) on the CBS Television Network. LET’S MAKE A DEAL is produced by FremantleMedia North America. The one-hour show is broadcast weekdays (check local listings) on the CBS Television Network. What do you think? Do you make a habit of watching any of these daytime shows on CBS?